* Mr. & Mrs. Ukkubandara Ranatunge Gold Medal in Fine Arts (Best result of the Special Arts Degree) , University of Peradeniya , 2002. * D.R. Wijewardena award and certificate for meritorious performance Sinhala language (G.A.Q), University of Peradeniya, 1999. * “Praghna Ankura” award for Art, Festival of Literature, University of Peradeniya . 1999 . * Solias Mendisge Bouddha Bithusituwam kalawa (Solias Mendis and His Buddhist Mural Painting), S. Godage & Brothers, Colombo 10, 2004. * Wisivana Siyavase Sri Lankeeya Vihara Bitusituwam Kalava, (20 th Century Mural Paintings of Sri Lanaka ) Ariya Publishers , Warakapola. 2011. * Sri Lankeeya Shasthralee Chitra Kalawa (Academic Art of Sri Lanka ) Ariya Publishers, Warakapola. 2011. * Japan Kalawa (Japanese Art, Architecture and Sculpture-Pre historic to Modern) , Sinhala Encyclopedia ,- ed. K.N.O.Dharmadasa, Vol. 2, Ministry of Cultural Affairs & Natural Heritage, 2011. * Sri Lankawe Chitthra Kalawa (Prag Ithihasika ugaye sita Nuthanaya Dakva),Sri Lankan Painting (Pre historic to modern), Sinhala Encyclopedia , -ed. K.N.O.Dharmadasa, Vol. 2, Ministry of Cultural Affairs & Natural Heritage, 2005. * “A cross-cultural critique revealed in Mural found in temples belonging to the Kandyan traditional in colonial Sri Lanka”, Abstract, The Royal Asiatic society of Sri Lanka, 4 th research conference, ed. 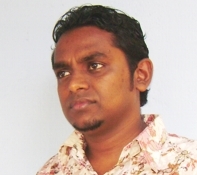 Oliver Abeynayake & Others, p. 168-169, March 25 th –26 th 2011. * “A study based on the semeiotic in the Buddhist temple art in the Kandyan tradition”, Proceeding of the fourth International conference of Sri Lanka association of Buddhist studies, ed. Russell Bowden & Ven. Ming Wei, p.44-45,December 10 th –12 th 2010. * “The Influence of Expressionism on modern Sri Lankan Art”, Proceedings & Abstracts, Postgraduate Research Symposium, Faculty of Arts, University of Peradeniya, ed. Prof. G. A. Somarathna & others, p.53. 24 of February 2007. * “European Influence in the Paintings of M. Sarlis”, Proceedings & Abstracts, Peradeniya University Research Sessions,ed. Prof. Jayanthi Edirisinghe & Others, vol.11, p.25. 2006. * “Post- eighteenth century trends in Sri Lankan painting”, Proceedings & Abstracts, Peradeniya University Research Sessions. ed. Prof. B.M.R.Bandara & Others, vol.10, p.30. 2005. * “The Art of L.T.P.Manjusri: an evaluation with special reference to its artistic and philosophical background”. Proceedings & Abstracts, Post Graduate Research Symposium, Facuty of Arts, University of Peradeniya, ed. Prof. G. A .Somarathna & others, p.36. 21st of January 2005. * Solo Art Exhibition, University of Peradeniya , Sri Lanka -2002. * Solo Art Exhibition, University of Peradeniya , Sri Lanka -2001. * Solo Art exhibition, D.S.Senanayake Library , Sri Lanka - 1997. * Recognizing Creativity” – Art exhibition organized by National center for advanced studies in Humanities and social sciences in Colombo , Sri Lanka May - 2009. * 5 th International Art Festival- Organized by Poh-Chang Academy of Art and Rajamangala University of Technology Rattanakosin in Thailand – 2009. * The Queen's Gallery International Art Exchange Festival 2009, Bangkok , Thailand – 2009.